For more than 27 years, Dr. Akef has been committed to providing patients with the highest quality care. After graduating with honors from the School of Dentistry at Loyola University of Chicago, Dr. Akef continued to advance his knowledge of dentistry in graduate school where he specialized in periodontics. He then went on to practice dentistry in Los Angeles for a time, also gaining experience as an educator at both UCS and UCLA. 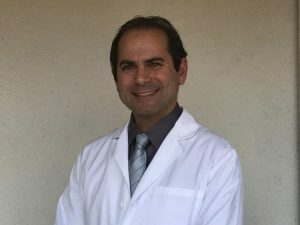 In 1994, Dr. Akef began practicing in the San Diego area where he has earned his reputation as one of the area’s top dental implant specialists and top surgical gum treatment experts. Over the course of three decades, Dr. Akef has gained a thorough knowledge and advanced skills in treating the complexities of periodontal disease (gum disease), dental implants, and other surgical procedures. No matter what kind of implant procedure or periodontal treatment you may need to get the beautiful, healthy smile you want, Dr. Akef’s expertise will provide you with safe, effective, and reliable care. He has successfully performed more than 23,000 advanced surgical procedures and always strives to continue his education in the field in order to offer patients the latest technology and proven advancements for the highest quality care and comfort. Advanced oral surgical procedures require advanced knowledge and skill to guarantee your safety and satisfaction. Dr. Akef and his team are equipped to handle any dental situation that may arise. We take the time to speak with every patient to understand their exact goals and oral health needs. We then discuss in detail all options for treatment to determine the best course of action. Dr. Akef and his staff are always happy to welcome new and returning patients with a friendly greeting and helpful attitude. We work to ensure your total satisfaction through every step of treatment. Call San Diego Dental Implants & Periodontics today to learn more about periodontal and implant procedures offered at our San Diego office.